Every Sunday I make a huge batch of grains to use for the week. Usually it’s quinoa. Sometimes it’s brown rice or lentils. Often it’s a mixture of all three. Whatever it is, it’s stored in the fridge and becomes a base for lunches and dinners…and yes, even breakfast. Think of the quinoa as oatmeal; it’s a vessel for the cinnamon, nuts and maple syrup. And just like oatmeal, it’s completely versatile. Add what you like. Raw honey instead of maple syrup, bananas and almonds in place of the walnuts and goji berries. Just have fun with it! This is a great breakfast to toss together in a glass jar on your way out of the house and then enjoy when you get to work! Easy, healthy Fat and Happy breakfast—Arguably, the most important meal of the day! Warm the milk, quinoa, maple syrup and cinnamon together. 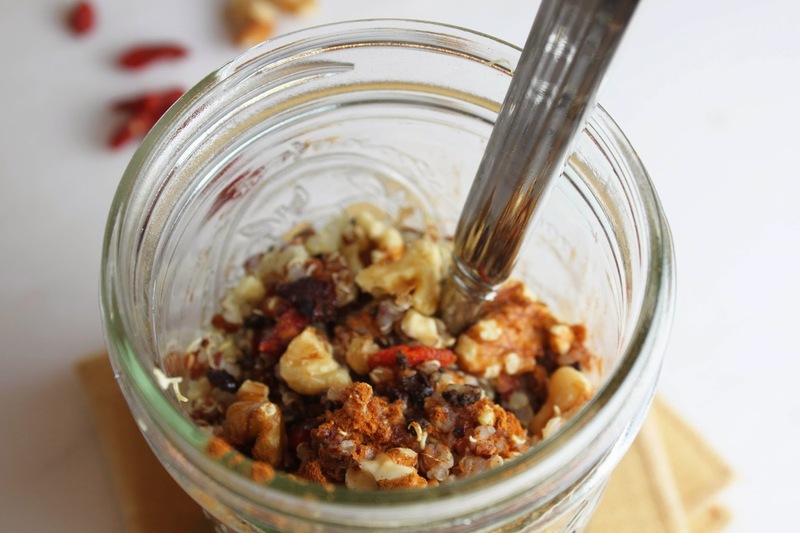 Top with goji berries and nuts and enjoy.